The maker of high-performance athletic wear delivered another quarter of double-digit growth, but concerns about increasing competition and slowing growth going forward have the market selling off today. This article was updated on March 16, 2017. Under Armour reported another strong quarter in October, with revenue up 22% to $1.47 billion, a 16% increase in operating income, and 28% growth in net income versus the year-ago period. But at the same time, fears that the company's growth is slowing -- and that increased competitive pressure will make it harder for the company to grow its profits -- are weighing on its stock even after a relatively strong quarter. Sales in North America, which has been Under Armour's main market since its founding, grew 16% as demand for athletic apparel slows in this region at the same time competitors continue to focus on increased marketing here. This was a key reason Under Armour's quarterly sales growth, while strong at 22%, was the slowest rate of growth the company has delivered in six years. On the earnings call, CFO Chip Molloy said that Under Armour expects the company's growth rate, going forward, will be slower than management anticipated only last year. And while the company reiterated its guidance for full-year revenue growth of 24% to $4.925 billion, and operating income growth of 8%-9%, it backed away from its longer-term profit growth projections from its 2015 investor day. The company is still on track to reach $7.5 billion in sales by 2018, but said it would grow operating income approximately 15% per year, falling far short of the $800 million it had been projecting to reach by 2018. Under Armour's focus under founder and CEO Kevin Plank continues to be the long-term opportunity. It's evident after this call that management isn't willing to make short-term moves, such as cutting marketing or R&D spend, simply to reach short-term profit goals. To the contrary, management seems to recognize that taking these steps would likely weaken the company's long-term prospects, particularly in growing its international business and footwear category, areas where the company is investing heavily today in both marketing and product development. 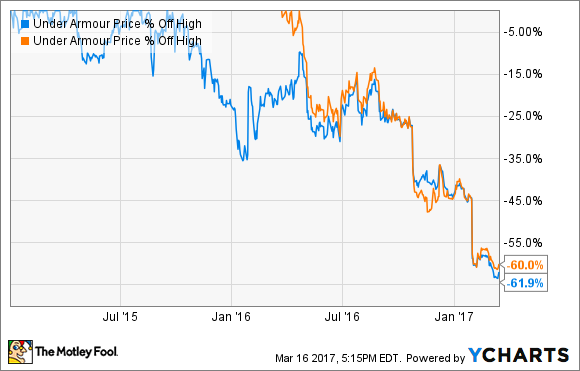 Furthermore, Under Armour is one of the most-shorted stocks in the S&P 500, in no small part because its shares have regularly traded at a very high multiple to earnings metrics, and it's possible that today's (Oct. 25, 2016) announcement may have led to an increase in short interest in its shares, further pushing its share price down. Profitability is critically important to any business, but Under Armour's success as an investment will be the product of how well it can establish itself as a household name around the world. It's evident after the earnings call that Plank and company are playing the long game, while Mr. Market continues to react to short-term news.